For the first time in a LONG time, my reaction after watching Breaking Bad on Sunday night was one of worry, rather than the normal hype of what an awesome cliffhanger they decide to throw at us. I was on my feet standing up during the entire last ten minutes of the show.. trying to cover my eyes out and avoid the fate of our beloved characters, while at the same time being more tuned in to the show than almost ever before. I was literally walking in circles around the living room as the final credits rolled. What. Just. Happened?!!!! Honestly, this episode felt like a finale. And yet we still have THREE more to go! What are you doing to us Vince?! I can't take it. I feel like it's too soon to kill off any major character. I wasn't ready for that. Maybe, MAYBE in the penultimate episode (or finale), but now?! My heart. Okay. Slowly recovering. Hence why it took me 3 days to digest and get the guts to write my thoughts on all this. It's funny because as the episode started and they threw in all this dialogue with Jesse's "mystery plan" and trying to get Gomez on board/ The Huell scenario.. I was kind of like, "okay, how are you going to tie this all up in three more hours?" Cue face palm. Why do I even doubt this show for one second?! Come the last 20 minutes and there's more going on than an entire season combined. To me, the darkest part of this whole episode was Jesse's phone call to Walter. This is the first time in the entire series that we hear Jesse address him as "Walt" -- no longer is the respect of authority in tact (and rightly so). His tone when he was talking to him on the phone was one of the most chilling exchanges of the entire series for me. So much rage, anger, and desire for vengeance. To be honest, I was so distraught at the phone call in general that I totally bought the whole fake photo trick. Literally felt like I was Walt in that moment. The camera shots of him driving like a madman to the desert kiiiiilled me. I seriously felt his fear and panic. And then the reveal. Walt's sudden realization that his phone had been bugged. Wow. It's crazy because throughout the whole show, Walt's been the one with a questionable (if you will) moral compass, whereas the rest of the characters remind us of ourselves with their normalcy. During this season specifically, I think the tables have all turned. Where Saul was once the comic with wit to share no matter how dark the circumstance, he's now become just like the "bad guys" -- on a spree to kill Jesse no matter what. It was WALT who had to convince him not to lay a finger on Jesse. Even when talking to Todd's Nazi-loving uncle & co. Walt was the one who had to stress the fact that "Jesse is like family." I've seen Walt's love for Jesse from the beginning.. and that's why even last episode I FULLY believed that Walt genuinely wanted to explain the whole Brock situation to him. At the end of the day, he wanted Jesse's forgiveness... if not forgiveness, at least his understanding of the situation. I think that's why seeing Jesse with Hank hit him the hardest. For once, Heisenberg was blind-sighted. This was the last possible outcome Walt saw coming. And to be honest, I do think that it IS a little shady of Jesse.. He's known as a rat now. And he broke the one rule you don't break. As much as I love Jesse, that's one thing that continues to bother me as the show goes on. Like I said, it's so chilling to see his attitude towards Walt now. When he saw Hank handcuff him, that smirk on his face, almost a sigh of relief, was so telling. It was sad but I guess you also breathe that relief with Jesse -- it's like he's finally free. Free of this guy who has been pulling his chain for years. And then comes the massacre. Okay. The thing that shocked me the most... after all this, after threatening Hank and going against the entire family, Walt STILL decides to call it off when he sees Hank. It's so hard to read between the lines and know what's going on in his head but I was genuinely surprised he called it off. First we see a reaction that conveyed more shock than anything we've seen all season, and then he calls it off! Not that I'm complaining, I don't want any of them to die, but it was very interesting to me. I have no idea what to think. My guess is as good as yours for the outcome of the gun fight. Although I do think that Hank dies. That phone call to Marie just seemed way too contrived to mean anything else. Maybe I've just seen Scream too many times but I totally felt like Jamie Kennedy's character with the "rules" for scary movies (#90'sreferencesforthewin). But seriously, "I love you" / "I won't be home til later"... yeah he's a goner. Gomez? Who cares. Nazi-clan? Who cares. And then we all know Walt makes it (1. because the Nazi's are doing their best to protect him and 2. because we've seen him in the flash forwards). And honestly, I don't even want to go there with Jesse because it hurts my heart too much, lol. He can't die. Especially not when there's three hours left. GAH. Okay. Apologies for this post but honestly this was one episode that I didn't even want to talk about. I feel like that hour spoke for itself. There really isn't that much more to say. And even guessing around about what could happen is almost pointless. It could seriously go either way. What I will say, is that I fully trust these writers. And I believe in the message Vince is sending so I think the ending will be satisfying and real. 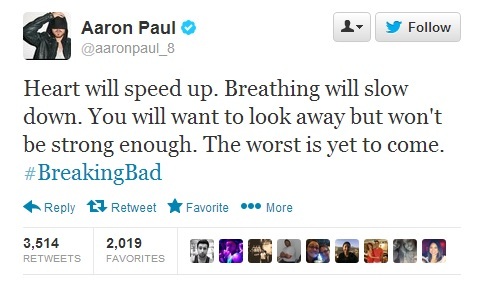 Revert back to the top photo from Aaron Paul himself. God speed.